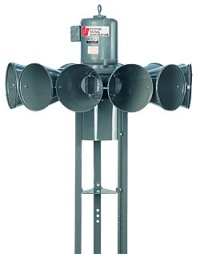 The STH-10 was an omnidirectional, electromechanical siren produced by Federal Signal Corporation. It was a very simple 12 port, single tone siren that was partnered with the STL-10. The STH-10 was succeeded by the Eclipse 8 in 2006. Production of the single phase model, or STH-10B was ceased on December 4th, 1995. Production of the three phase model, or STH-10A was ceased on December 5th, 2005. The STH-10 was created as an alternative siren from the STL-10, mainly for fire departments or non-civil defense uses, however, some places used it as one or both (as a Civil Defense Siren and Fire Siren). ↑ 1.0 1.1 1.2 (PDF) Service Manual, Outdoor Warning Sirens, Models 2, 5, SD10, STH10, STL10. Federal Signal Corporation. Retrieved October 22, 2017. This page was last edited on 27 February 2019, at 14:24.